Who says nutrition can't be fun? At Nourish Interactive, we are always looking for creative ways to encourage families and children to make healthier choices. To add a little excitement to the mix, we often have special fun campaigns that promote healthy foods, choices and daily active . Most campaigns are associated with some type of contest, giveaway, sweepstake and/or discount. We believe that each little change will add up to a healthier child. We are not asking for money. We are asking you to make a pledge or commitment to help the children choose more fruits and vegetables. Our giveaway this month is a healthy eating game. It uses positive reinforcement to help children choose more fruits and vegetables. Make a pledge and be automatically entered to win the Raise Your Rainbow Game. Become a Nourish Interactive member and use the website. Each time you use the website in any way you are automatically earning points. Users with the most points each week will be the winner! 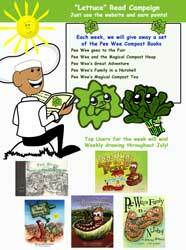 Our giveaway this month is five book set that teaches children about the fun of composting through a wonderful little character named Pee Wee. Castle Compost Book Set. A new family challenge each week. Three simple steps to get automatically entered. A complete DVD set to be given away each week! A box of Green Goods Snacks will be given away each week until Christmas. 100% of your fruits and vegetables requirements! Thanksgiving is a time to remember all the fruits and vegetables in the horn of plenty. To help toddlers and preschoolers learn about these important Thanksgiving foods, we are giving away board books that tell bring these foods to life. Books every week until Thanksgiving. Zenola Brandon Detroit, MI 3 students won! Courtney Drake Fenton, Mi 2 students won! 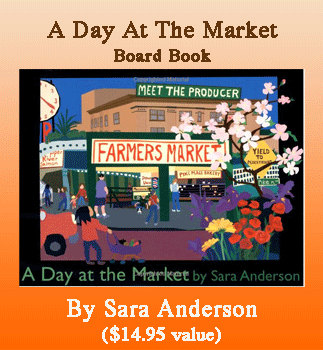 Help kids practice their reading with a story that promotes healthy foods to kids. Well this summer, we have gathered up some of our favorite reading books that have a positive healthy message for children. Each week we will be giving away a storybook. To enter, all you have to do is have your child or student log in. 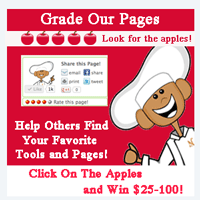 Every time they log in, you will be entered in our Lettuce Read Healthy Book Giveaway. We have thousands of new visitors each month and want to help them find our best pages. Wherever you see our five apples, just click on the number of apples you feel the page deserve. our monthly drawing for $100! You must be a member to participate. Just look for the apples! We are not asking for money. We are asking you to make a pledge or commitment to help the children in your lives make healthier choices. Thank you to over 1,600 people who have joined us in helping children add one healthy habit each week. We have reached over 62,000 people with our campaign! A weekly giveaway to say thank-you from food manufactures like Lundberg, Bob's RedMill, World Foods, Brainfood Gardens, Peter Rabbit Organics, Dreamfields, I.M Healthy SoyNut and more...!